The Army of Women recruits participants for various research projects. These studies need healthy women (and men) to help researchers find the CAUSE of breast cancer. Women who have never had breast cancer and who do not have a family history of breast cancer may be compared to women who do have breast cancer, to see what differences there are between all different types of women. This is why YOU SHOULD JOIN! 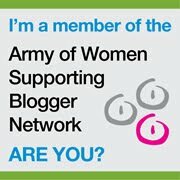 There is no obligation, joining Army of Women is free, and all participation is completely voluntary. Read all about the current research projects that are going on now: Current Projects. Maybe, just maybe, you will be able to join a research project that helps us find the cause of breast cancer! I'm on it. Like you, this is so important to me!